Unique, handcrafted designs for that one-of-a kind look! A vintage Art Deco money clip is the focus of this unique signed necklace. 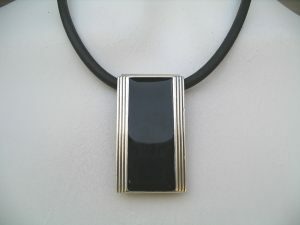 Black Euro rubber cord with sterling silver clasp. Pure Deco! Please get in touch to offer comments and for further details and information.